As many of you are aware, Tropo is winding down operations. Tropo’s free developer accounts will be disabled October 31, 2018, and paid accounts on November 30, 2018. More details on the discontinuation of service can be found here. Ytel understands it is a difficult situation when your provider halts business operations. We can offer you a solution to easily forklift out your current code from Tropo to Ytel and get you up and running again. Ytel understands it is a difficult situation when your provider halts business operations. As a CPaaS provider with years of experience providing intelligent communication solutions, we can offer you a solution to easily forklift out your current code from Tropo to Ytel and get you up and running again. To make the transition process from Tropo as simple as possible, we will assist you in porting your Toll Free and Local Numbers from your Tropo account at no cost. Email us at support@ytel.com for free 24/7 support or message us on intercom 24/7 via ytel.com and we can get that process going for you. Ytel is a RESPORG and has the capability to quickly transition your numbers. The information below will help guide you in setting up an account, adding some promotional funds, and sending out your first SMS. It will also provide you some examples on how you can convert Tropo Call and SMS functionality over to the Ytel API. You will be surprised at how easy it really is! Get right to it - go straight to the API Reference Documentation. Enable voice, messaging, or mail communications into your applications with just a few lines of code. Our RESTful API will get you up and running in no time. An account is required to get started. 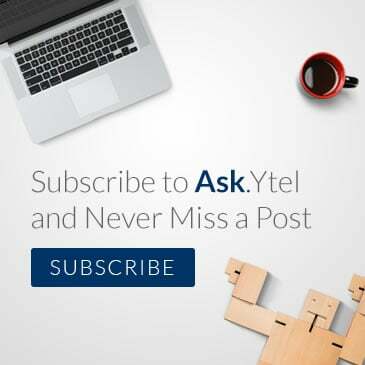 Are you new to Ytel and the API we offer? Sign up for our API or visit our website for more information and start communicating today. Once you sign up for an account, check our documentation regularly. We update and improve features quite often and are constantly adding functionality to the API. We are also adding and growing out our library of communication API SDKs for both developers and content managers. Ytel API Reference docs for viewing sample code and documentation on all our API endpoints. Access all our SDKs Libraries for connecting to the API. For updates and news, follow the AskYtel blog and find us on Twitter @askytel. The below guide will get you going in sending out your first SMS. Visit the web portal and sign up for the API. You will be asked to verify your phone number when you sign up to make sure you are human and not a bot. Once the form is filled out, you'll get an email with an activation link that will guide you through getting your account set up and configured. Your first number is on the house! As a Tropo customer, we are extending to you a promotional code offer for $25. This will allow you to buy a number free of charge and test out our services. You can add that promo code under the Billing->Add Funds menu at the top the page after logging in. Once you have $25 in your account, go to the top menu and select Numbers-> Buy a Number. Buy a number from the top menu bar. Once there, select any SMS enabled number and click Buy. Once you go through the account sign up and verification process and login for the first time, you will see your API credentials. 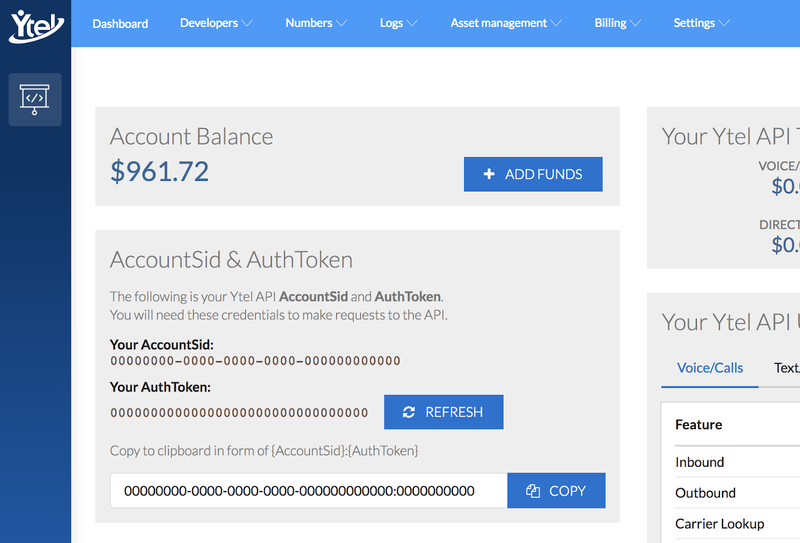 Understanding where your Account SID and Token are located is the first step in utilizing the API platform. On the dashboard, your Account SID and Token can be found in the upper left. We supply you a list of all of our API endpoints. Make sure you have everything you need to send a test SMS. 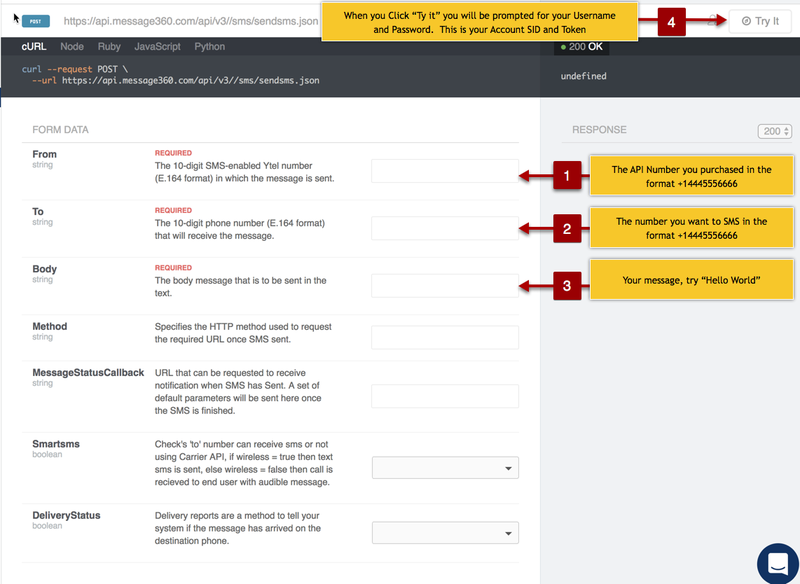 Now let’s take a look at the Ytel API Reference for sending an SMS. Below is an image that describes what the pertinent fields mean that you will be filling out. Type in the message you want to send to yourself. One message is 160 characters in length. Click the “Try It” button. You will be prompted to enter in your username and password. Your Account SID is your username and your Token is your password. collect['body'] = "Don't forget your meeting at 2 p.m. on Wednesday!" The Ytel API uses an XML Schema called InboundXML. When your outbound call is answered by the party you are calling, the URL you supply in the “URL” field will be sent some basic call information. We understand the difficult situation you are in as a current Tropo customer. We're happy to help get you migrated over to the Ytel API and up and running in no time. For more assistance, email support@ytel.com or click here to get in touch. We look forward to working with you! Matt provides Ytel with avenues to do things different. As a software developer with close to 20 years experience, Matt is aggressive on deliverables and is able to get projects done. Matt is a successful inventor and has been founding companies with Nick for the past 15 years.